NSW DPI is leading the way in the use of weir removal as a management tool to address river degradation. The removal of weirs is a complex process that needs to address the requirements of the environment as well as the cultural, heritage and social issues of the community. Since the construction of many weirs, circumstances and community needs have changed. For example, an alternative water supply may now be available and an old weir may no longer serve its original purpose. Some of these structures, particularly those near towns, may have developed secondary uses such as recreational and visual amenities for local communities, but others are now redundant and should be removed. Weirs may be able to be removed where they are no longer serving a useful purpose. NSW DPI has commenced a Weir Removal Program with funding from the recreational fishing license. A number of weirs have now been removed, improving fish passage to hundreds of kilometres of waterways in NSW. A number of older weirs need major maintenance or refurbishment. Before significant expenditure is incurred, the owners and the community should consider if the cost would be better spent on an alternative water supply, or upon significant design changes that will reduce the environmental impact of the structure. Such modifications may include the instalment of fishways which improve fish passage. The modification of the Stroud Weir, on the Karuah River, to include a rock-ramp fishway is one example. (Note: this page contained many photographs and may take a while to load). Removal or modification of barriers to fish passage such as weirs will result in improved stream connectivity, better water quality, increased biodiversity, and enhanced recreational angling benefits. The removal of instream barriers results in the reclamation of valuable habitat for aquatic fauna and the reinstatement of normal fish migratory processes. Many native fish species have a migratory component within their life-cycles, whether for the purpose of reproduction or for habitat expansion. Migration also acts to increase the genetic diversity of fish populations and improve the genetic health of native fish stocks. The Detailed Weir Review project investigated 109 weir structures across the former 13 CMA regions of NSW (now Local Land Services). The individual detailed reviews can be found in the reports for each former CMA region. The Branch River Crossing is located near Port Stephens on the Karuah River catchment, approximately 22 km north-east of the township of Karuah, NSW. The crossing was situated on a natural rock bar at the upper end of the tidal limit. 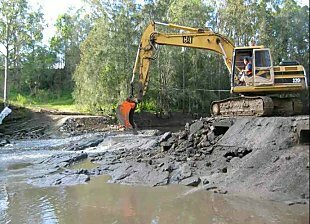 The removal of the Branch River Crossing was part of a larger weir removal project being undertaken by DPI, WWF Australia and the NSW Environmental Trust. This project aims to increase public awareness of the environmental effects of in-stream barriers. It provides a framework to facilitate community based weir removal projects and demonstrates the ecological benefits of improved river health. An excavator and rock breaker were used to break the concrete cap on the Branch River Crossing (left). A couple of metres of the crossing was left near the edge to maintain bank stability (right). In less than four days fish passage was re-instated to approximately 30km of the Branch River for the first time in 52 years.